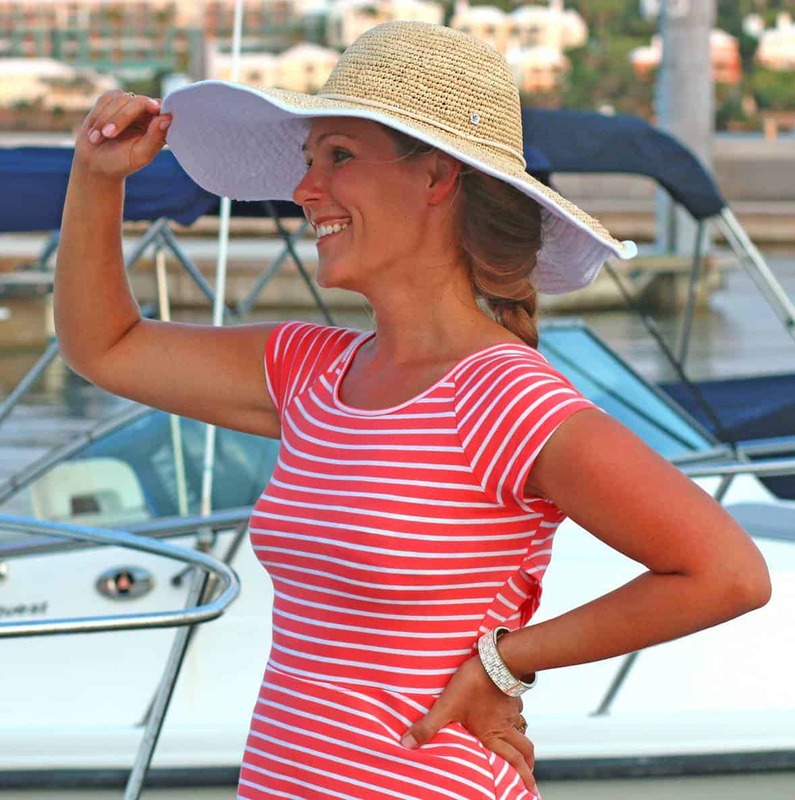 Thank you to Pollinate Media Group for sponsoring this post. 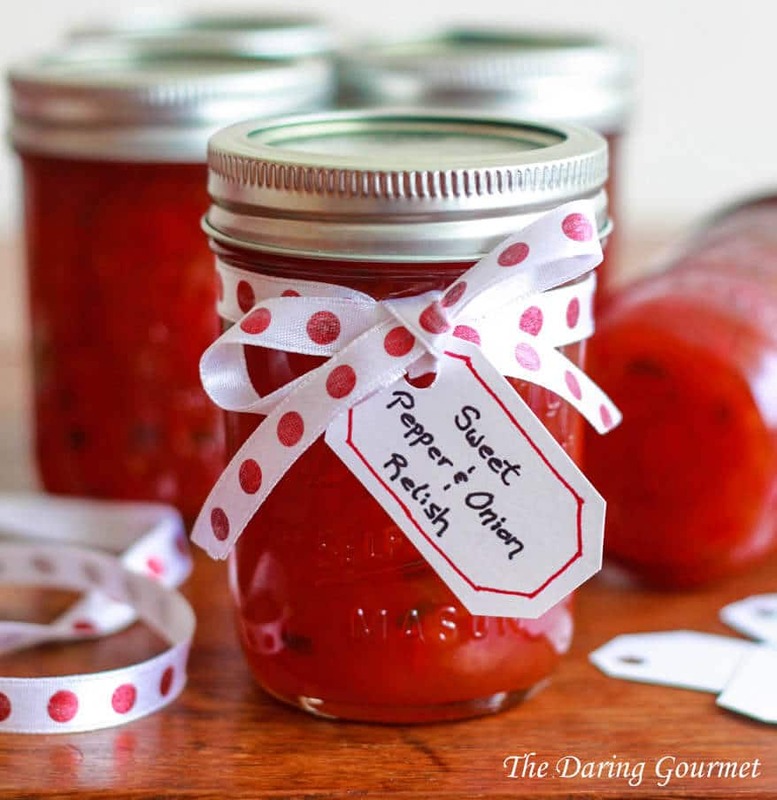 This Sweet Pepper and Onion Relish is my copycat version of Harry & David’s popular treat. It’s delightful mixed with cream cheese and spread on crackers or used as a glaze for pork and chicken. And it makes a fabulous gift! I always enjoy receiving homemade gifts. When someone takes the time to make something for you, whether it’s a simple plate of cookies or some elaborate craft, it says a lot. It makes you feel all the more unique, special, appreciated and loved. Cooking happens to be one of my biggest passions, and so naturally I particularly enjoy making gifts for people that are edible. Christmas cookies, as always, are on my list this year along with a few other goodies. And today I’m sharing a special one with you. I picked up this month’s issues of Cooking Light, Real Simple and Sunset at Safeway and once the kids were in bed I enjoyed a luxurious evening thumbing through each issue. One of the recipes in Cooking Light is for glazed chicken that features red pepper jelly. The moment I saw that the light bulb came on. 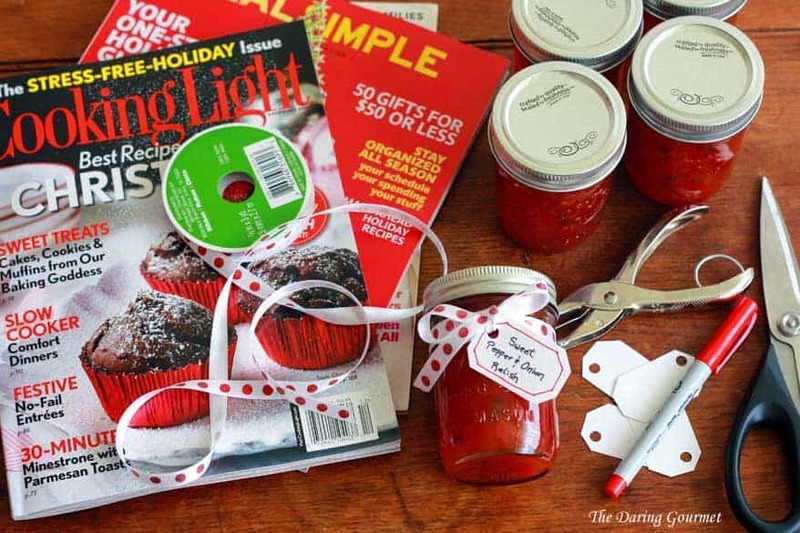 What a great gift idea – homemade red pepper jelly. As the wheels continued turning I thought about a red pepper and onion relish that I love from Harry & David that’s especially popular during the holidays. It’s delicious mixed with cream cheese and spread on crackers, or used as a glaze for pork or chicken. Those tiny jars of it are pricey for what you get and so I decided to make my own copycat version. Back to Safeway to buy some more canning jars, pectin, and the ingredients for this relish. Then back to my kitchen to finish up the experiment. The end result: It’s fabulous! You’re going to love it and so are the lucky recipients of your gift! Just add a ribbon and a little tag and your gift is complete! Combine all the ingredients, except for the pectin, in a large stock pot. Bring it to a boil, reduce the heat to low, and simmer, uncovered, for 1 1/2 hours, stirring occasionally. Now it’s time to add the pectin. You won’t need much because most of the liquid will have evaporated by now. Add the pectin (I used and recommend Ball’s Realfruit Classic Pectin), bring the mixture to a rapid boil and boil for 1 minute. Remove from the heat. 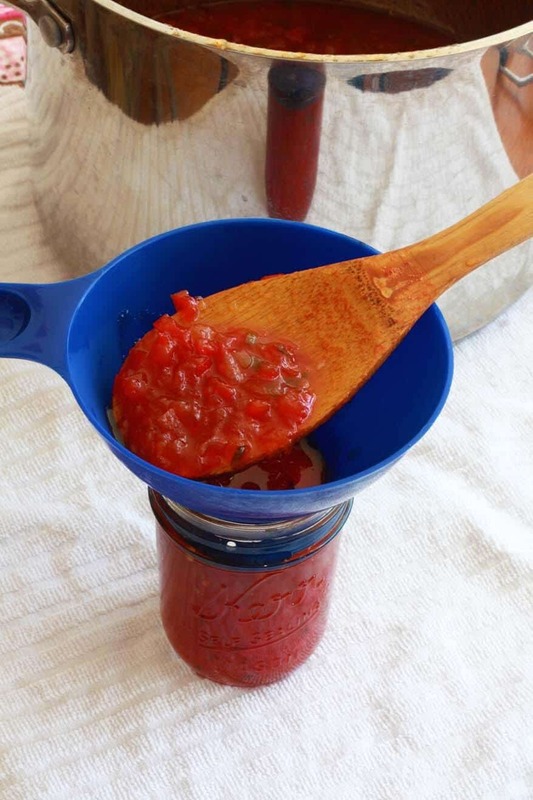 Immediately ladle the hot relish into hot sterilized canning jars with sealable canning lids. Process in a water bath for 20 minutes. * A note about the water bath process: There are specific canners for the job – this is the one I have. It’s deep enough to fully cover the bottles by several inches, it has rack with separate compartments that keeps the bottles separated so they don’t break by getting knocked against each other while boiling, and it comes with all the extra equipment you’ll need. If you don’t own a canner and don’t want to buy one, just use a large, deep stock pot and place the jars in it with the water covering the top by at least two inches. Remove the jars from the canner and let them rest for 24 hours undisturbed before moving. This Sweet Pepper & Onion Relish will keep up to a year. This recipe makes about a dozen 1/2 pint jars. For the ones you want to give away as gifts, just tie a ribbon around them with a little label. Are they cute or what? Enjoy this relish mixed with cream cheese and spread on crackers, as a glaze for chicken or pork, or however else your imagination inspires! A copycat recipe of a Harry & David favorite. Deliciousl mixed with cream cheese and spread on crackers or used as a glaze for pork and chicken. *See NOTE if relish turns out too runny. Place all the ingredients, except for the pectin, in a large stock pot. 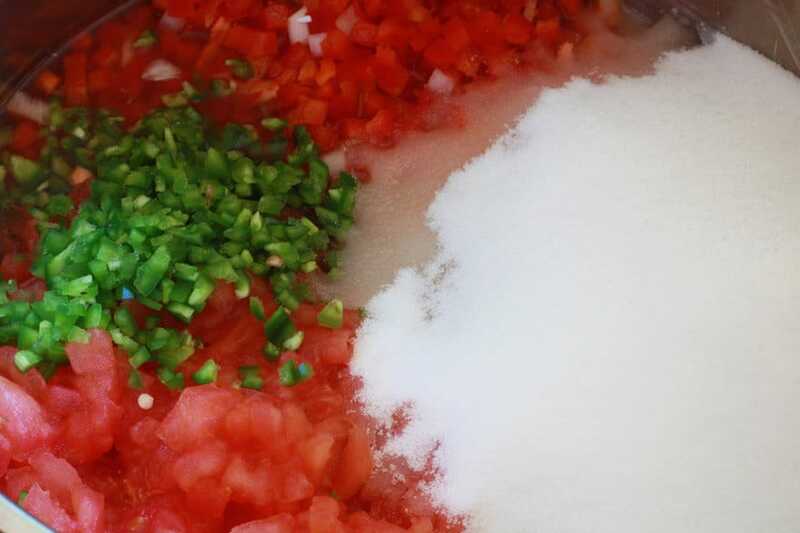 Bring the mixture to a boil, reduce the heat to low, and simmer for 1½ hours, uncovered, stirring occasionally. Add more cayenne to taste if desired. Add the pectin and quickly bring to a boil for 1 minute. 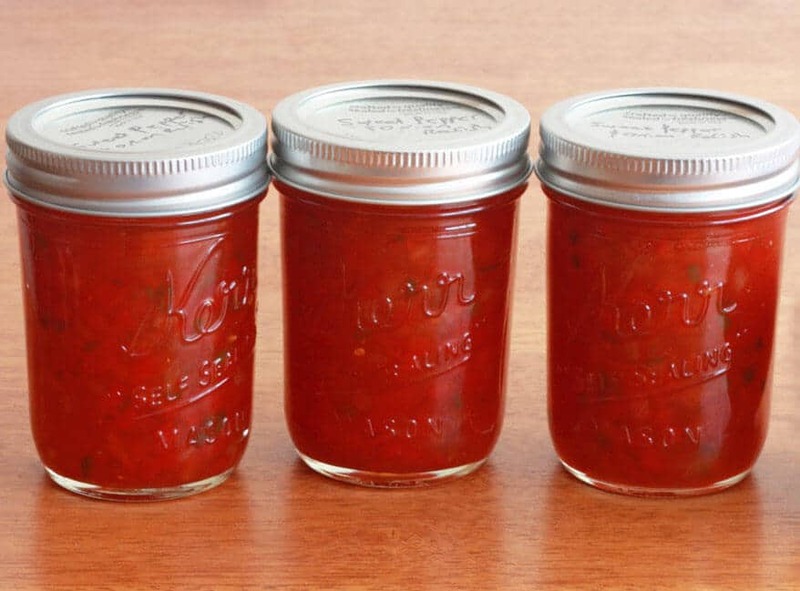 Remove from heat and ladle the hot mixture into hot, sterilized canning jars. Process the jars in a canner or large stock pot (see note on canners in post), with the water at least one inch above the jars, for 20 minutes. Remove the jars and let them sit undisturbed for 24 hours. Relish will keep for up to a year. Makes about a dozen ½ pint jars. This sounds like fun. A suggestion, if I might: when I was making jams/jellies/preserves, etc. that were processed in a hot water bath, the instructions I had said to stand them up top down for 10 minutes or so before turning right side up. This will help with creating the vacuum that seals the jars thoroughly. That was many years ago, but it still makes sense to me. I saw a presentation on canning tomatoes on the program “The Chef and the Farmer” and my friend cans some items suitable for water bath canning in the same manner. But if i understand correctly, this is only done if your sterilized jars are fresh out of boiling water therefore very hot and the product you are caning is still boiling hot. You would also want lids in hot water ready to use immediately and jar rings are ready to apply. I am not a food scientist or recommending this method but just passing on what I have seen (as I remember it) and heard about the method since you asked. I made this recipe once and it was good so making it again today with addition of double jalapenos. That makes sense, Susan, and sound advice never comes with an expiration date – thank you! Hi, Chris, thanks so much for visiting and for the compliment. Just paid a visit to your site and it’s lovely. I’m going to pop by again later when I have a little more time. Have a wonderful weekend! Any particular type of tomato you would recommend? Hi Jennifer! I use Roma’s because they’re more fleshy and less watery. Mase these but we used canned, diced tomatoes which we drained. Turned out fabulous. Thanks for sharing this awesome recipe. We look forward to making more. Canned tomatoes work great, too, Lyn. So happy you enjoyed it and thank you for the feedback! Do u cook the tomatoes first to peel and seed them? Hi Melanie! Yes, they’re much easier to peel if you blanch them first. I’ve added that note in the recipe. Simply put the whole tomatoes in boiling water for about 30 seconds and remove them. They’ll be very easy to peel that way. I have been making this recipe exactly this way since 2014 and everybody loves it. One jar mixed with a brick of softened cream cheese makes a killer dip! That’s so awesome, Melanie, thank you! Sorry that should say 1/2 jar mixed with 1 brick cream cheese. I was wondering if I could make this recipe in the 4 oz jars? I think they would look cute as a gift with the recipe attached for the dip and a bag of gourmet nacho chips? Hi Melanie, absolutely, you can use any size jar you like. Processing time will be the same for smaller sizes. Mine was very watery even after the whole cook time. Will it thicken when it cools from the pectin? Hi Mlink! It will get thicker, but if it was “very” watery after the cooking time and you added the pectin, then something went wrong. 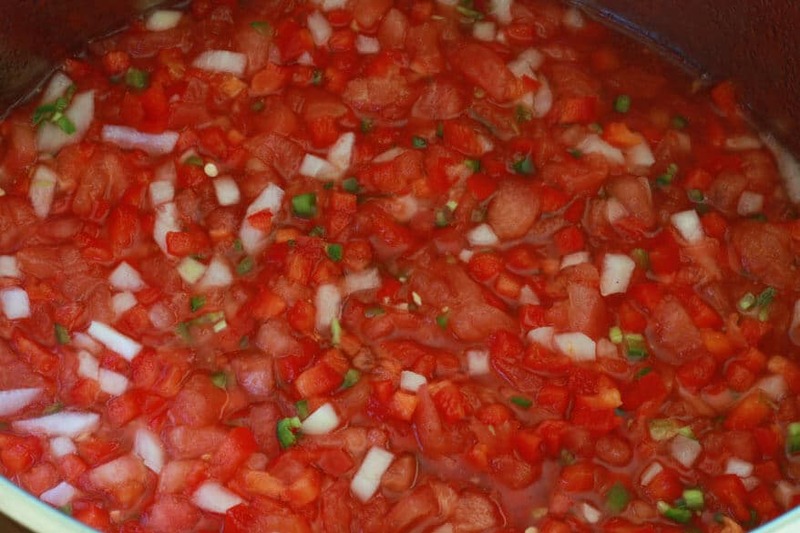 In blanching the tomatoes and squeezing out the seeds a good amount of water will also have been discarded. Important too is that the pectin isn’t expired and that it’s brought to a full boil, but only for a minute. If something went wrong and it’s too watery, you can add more pectin and boil it briefly. Be careful with the pectin though because it will get thicker as it cools and you don’t want it to end up like thick jello. When we made it using canned diced tomatoes, we drained them and measured to 6 cups. No blanching. We had more of the relish then indicated in your recipe so we thought we may have done something wrong. We used pectin and it was new and ours was watery as well. Maybe there is a knack to using pectin. It has gotten a little thicker but still is so delicious. We plan on making again so maybe we will use more pectin and see how we make out. Is it still watery? It can take a full 24-48 hours for pectin to set properly. Shake one of the jars and see if it’s runny. If it is, you can still “rescue” them by opening the jars (you’ll need to use new lids but as long as the rims aren’t bent you can reuse those), pour everything back into a pot, bring back to a boil and stir in more pectin. Then can again. You can do a test first: Put a small spoonful on a plate and wait a couple of minutes. Is it set or still running all over the plate? I’ve never made it with canned tomatoes so I honestly don’t know how that would impact the final results, but anything will set properly with enough pectin! I’ve increased the pectin amount on the recipe. The feedback I’ve gotten is split down the middle in terms of pectin amount. For me, the mixture always cooks down and a lot of the liquid evaporates, requiring less pectin. But there can be quite a bit of variation depending on the kind of tomatoes used. I like to err on the side of too liquidy because it’s an easy fix. When I was developing this recipe I used too much pectin the firs time and it was a wreck! Next time try it with the adjusted pectin amount and do the “plate test” before canning it to see if it needs a little more pectin. Sorry for all the comments but as for the plate test, you do that before you put in the jars and it should not runny? I would hate to go through all the work and money and it be a wreck! Guess you can always add more, not remove it. Thanks again, appreciative all your helpful hints and who knows, maybe it is helping others. No problem at all! This thread will be helpful to anyone reading it. Yes, perform the plate test right after you’ve added the pectin and rapidly boil the mixture for a minute. Turn the heat off and dab a little spoonful onto a cool plate. Wait for about 2 minutes and then check the texture. Keep in mind it’s a relish and you don’t want it to be thick like jam. But it shouldn’t be watery either. If it’s still too watery add a little more pectin and boil for another minute. It can be tricky though because it can take pectin a full 24-48 hours to set properly and you don’t want to end up with a really firm texture. Let us know how it goes! I followed your recipe with great success. Many smiling faces. Thanks! Wonderful, Greg, so glad you enjoyed it and I appreciate the feedback! Very interesting fine, Kimberly today. When I printed out your recipe on 7/3/14, for some reason, the recipe calls for 1 tbs. pectin and I noticed today, your recipe now says 3 tbs. That would totally explain why ours was runny. do you remember changing it at some point? I do! Read through the previous comments for an explanation. Also note, depending on the elevation where you live, the simmering process may cause the liquid to evaporate more or less, so you may need to tweak the amount of pectin you use accordingly. Are you using liquid or powdered pectin? Hi Joann, in the recipe box I include a link to the pectin I use and recommend: Ball’s RealFruit Classic Pectin. It’s powdered. I haven’t made this with liquid pectin before, let us know how much you used to get the right consistency. Thanks, Joann! I used 1 package or 3 oz of RealFruit Pectin by Ball. I also added 2 more cups of sugar, as I wanted a sweeter, less tart, flavor. The consistency is runny, but usable. Now the question is did the relish not set up because of the brand of pectin or the amount used. There are only 3 reviews of the RealFruit Pectin on the Ball website and all 3 are very negative about the achieved results. Using a substitution ratio of 1T liquid to 2 t of powder, I should have used only 4.5 T of liquid pectin. I added 6 T and as I said, it is still runny. I am going to try Certo brand the next time and see if it makes a difference. If anyone does that soon, would you please post your results. Regardless of consistency, the flavor is great. Thanks, Kimberly. Joann, Ball is the only one I’ve used for this recipe and it always works for me (I use it for my jams as well). I haven’t experimented much with liquid pectin or other brands so I’m afraid I can’t offer much info there in terms of a comparison of results. Yes, any feedback on varying results depending on brand and type of pectin would be much appreciated from anyone! Why do you say it will keep “up to a year”? I always thought that home canned goods were good for a bit longer than that? Hi Beth! That’s simply USDA language. Yes, canned goods generally do keep longer than that, though the quality of taste can be compromised. I am so looking forward to trying this! Thanks for sharing your recipe, and thanks for all the helpful tips. Thanks, Trish! There’s a lot of info in the comments, too, if you run into any problems. Enjoy! 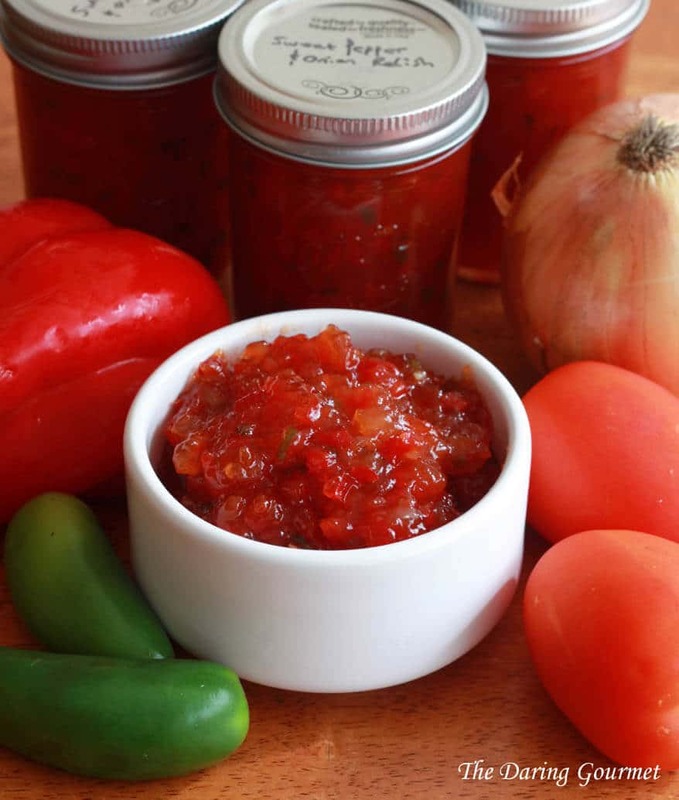 You indicated: Recipe for a glazed chicken dish using this Sweet Pepper & Onion Relish coming soon! ——- when can we see that recipe??? I’m waiting!!! Ah yes, thanks for reminding me, Sharon! With so many back-logged recipes still waiting to be published it’s hard to keep track sometimes :) The recipe is ridiculously simple: Sprinkle some chicken breasts or tenders with some salt and pepper and generously slather them down with the relish. Place them in a baking dish with sliced onions and red and green bell peppers, cover with foil and bake at 350 for about an hour if you’re using chicken breasts or less if using tenders (adjust length of time according to thickness of chicken and check for doneness.) The chicken is deliciously tender and the flavor is wunderbar! Serve with steamed rice or potatoes and any other sides of choice. Thank you! Sounds great! I’ll be trying it. I finally made this yesterday. I actually live in southern Oregon so I’ve eaten this relish from Harry & David’s store many times. It’s been awhile since I’ve gone in there because it’s a pretty expensive store but they always used to mix the relish with cream cheese and make a dip that they’d put on tortilla chips as samples. There was always a line for THAT sample!! Though it’s been awhile since I’ve eaten theirs, I think your recipe is every bit as good. I had a little bit leftover yesterday so after it cooled down we had some with cream cheese and tortilla chips!!! VERY GOOD!! I will definitely make this again. Mine did come out a little runnier than I would like. I read through all the comments before making and decided to use 4 tbs pectin…just in case. I am a relatively new canner and honestly, while I love the end results, I do NOT love the process. I find it to be a lot of work and pretty time consuming and something I’d much rather do with a friend. Anyway, it is still runny but I’m not going to re-can it. It will be fine no matter how we use it and next time I’ll either add more pectin or maybe try the liquid because I made jalapeno jelly with the liquid pectin a few weeks ago and it’s pretty stiff!! I’ve got lots to learn but as long as it tastes good, that’s fine with me. Too much work for a “do over”! The only other change I made is I didn’t peel or seed the tomatoes. I never do. I don’t mind the peels and again, guess I’m just a lazy canner! So glad you posted this recipe. I love this stuff and got to the point where I could no longer afford to buy it. Now I can eat it all year long with no guilt about the expense!!!! And now I might even share!! Nice to hear back from you, Kimberly! I just want to make sure that first and foremost others know this recipe is AMAZING!! You did a magnificent job of duplicating this relish. It is delicious and one of those things that virtually everyone will love! I know because it is a STAPLE in the Harry and David store in Medford, OR. And I agree…nothing feels better than reaching into the pantry and grabbing a jar of something you made yourself…something you know is free from additives and poisons!! And in my case, I’m extra thrilled because the tomatoes, peppers….even the onions were grown in my own garden with no pesticides!! I love that!! Finally, I hope you know I don’t blame you or the recipe for being runny. I’m pretty sure it was perhaps because of the tomatoes…didn’t seed them, etc….and as you said, some tomatoes are very juicy. I just want to get across that THIS RECIPE IS AMAZING!!! Next year when I can this (and I no doubt will because it WILL be gone by then), I will make more and I will not even bother with the jalapeno jelly because this is FAR, FAR BETTER!! Thank you!!! I have a quick question: If I am canning these in pint jars would it still be the same process time? Also, I am not using the ball brand pectin I am using SureJell brand…results should be the same, right? Hi Sandra! Yes, processing time is the same. Results can vary from brand to brand, unfortunately. After the mixture is done boiling, do the plate test – put a dab of the hot mixture on a plate and wait a couple of minutes. Turn the plate and see if it’s “set.” If not, if it’s too runny (keep in mind this is relish though, not jam, so it will be runnier than jam), then add a little more pectin and boil. Let us know how it goes. Enjoy! I have read all the comments and have a question. Can this relish be frozen instead of canned? Hi Carole, that’s a great question! I’ve never tried that and really don’t know how it would turn out. My first instinct was “no” but then there is such a thing as freezer jam… If you end up trying it, let us know how it turns out! That’s hilarious! :) I haven’t gotten any feedback about freezing this nor have I tried it. But because it contains pectin I wouldn’t recommend it. You’d need to try a freezer jam type version without pectin and I haven’t experimented with that. If you pioneer the way on this let us know how it turns out! If not, just can it like I do in this recipe. It will last at least a year. Haha, awesomeness!! Thanks so much for the feedback and I am THRILLED it was such a hit! I tried this recipe and it turned out great. However, I had my mother-in-law ask me if the recipe was tested for safety…something about the acidity level and botulism when canning. Apparently if you are using a hot water bath the foods need to have a certain pH level. Hi Julie, the water bath is simply an extra precaution. Most people in Western Europe don’t even use the water bath method because botulism is so extremely rare and if your cans are affected you’ll know because the lids will have popped, in which case you discard them. The water bath just takes that extra precaution to boil and eliminate any potential bacteria that might already be inside the can. I’m thrilled to hear you enjoyed this recipe and thanks for the feedback! Thank you for this great recipe Kimberly and thanks everyone for all the good tips . I’m on my second batch. It is so delicious . I’ve used Roma tomatoes and peeled seeded them. It’s a lot of work but well Worth the trouble. Wonderful, I’m so thrilled to hear that, Jeannette, thank you! It does take some time to make but fortunately it makes a huge batch. I’m getting ready to make another batch myself for some gifts! Thanks for figuring this out! I had this at the office yesterday and FELL IN LOVE! I’m making this tonight….wish me luck! I know, it’s such good stuff, Carey, I simply HAD to try and replicate it! Let us know how it goes! Maybe I missed it, but can this be made with a sugar substitute? Hi David, the sugar is a natural preservative and is essential for storing the relish long-term. this is interesting so different from anything I’ve ever tried before. I love the color in these photos! This looks fantastic! 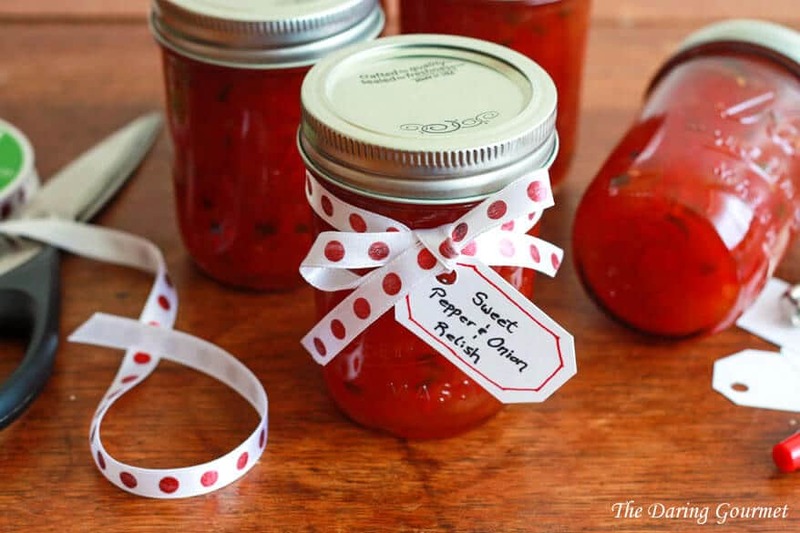 I love making food gifts and this relish looks fantastic! Canning is on my foodie bucket list of techniques to try. I think this would make an amazing gift. Say, for a food blogger. Someone who visits your blog a lot. Who happens to like relish such as this one. And her name might happen to be Kim. Just saying’. Ha, I absolutely love this. Nothing beats homemade condiments. My sister cans like a fiend. I’ve done it before but I get so nervous I’m not doing it right. Silly, I know. LOL, Kim! If we were neighbors I’d more than happily hook you up :) I know what you mean, I was pretty intimidated at the thought of canning, especially pressure canning, before I got started with it but after the first time you it’s all a breeze. What a delicious gift! I bet this was amazing on the chicken recipe! THIS would be so amazing on just about anything! I love a good relish. I’m ashamed to say I have never canned anything!! It’s always intimidated me but your directions seem easier than I thought! I just love homemade gifts like this! I just think they mean so much more than something bought at the store! Hi! I don’t have a canner so was just going to use stock pot as u suggested. My question is: after I bring cans to boil for twenty minutes and remove them, do I put them is ice water immediately after? Or just leave them on counter at room temperature?? Thanks! Hi LB, just leave them on the counter at room temp for 24 hours, then store them in a dark, cool place. Also, when using a regular stock pot I’d recommend crumpling some aluminum foil and placing it on the bottom so that the jars aren’t in direct contact with the bottom of the pan (which can result in the bottles breaking). Hello, this recipe looks delicious and is exactly what I am looking for, but i do have a question: have you ever had the ph tested? It sounds like you creates the recipe, and the basic preservation ingredients like sugar and vinegar are there, but are they enough? I have no idea! I just want to make sure it’s safe to consume after a year or even a few months (more than just the look and smell test) before I feed it to my family. Thank you in advance! Hi Laura, yes, the sugar and vinegar content (i.e., pH level) are more than adequate to keep anything unwanted from growing in it :) I actually just pulled out a jar from 2013 last week and used it for some baked chicken. For added peace of mind you can also get pH test strips to use in any canning recipes. I have less than 40 minutes to go and it still seems very watery. Is it advisable to ladle off some of the liquid? That’s normal, Robyn, let it simmer the full amount of time. The pectin will firm it up. I am making this tonight. I am using tomato paste as well per an internet search. Thanks! Awesome, Karalinda! I just used some of this relish again two nights ago to make some pork chops – it continues to be a family favorite. Fantastic, Chris, thank you so much for the feedback! Hello! I made this yesterday but used Pomona’s Pectin. Pomona’s comes in two parts, the Pectin and the calcium water. I used a tablespoon of each. It turned out perfect! Wonderful, Deb, I’m so glad you enjoyed, thanks for the feedback! Hi, Kim! Just made another batch yesterday! When you initially taste test, it’s too “puckers” and a little spicy, but it all calms down 😀 This time, I had peppers and no fresh tomatoes. I did a comparison between first batch and this new batch, same flavor, using fresh tomatoes or canned (which saves a ton of time using canned!) thanks again! Thanks for the tip on the canned tomatoes, Deb, that’s great to know! Instead of canning, has anyone put this into small plastic containers and store them in the freezer. Just take them out as needed? Absolutely A++. This tastes exactly like the relish from Harry & David, maybe even better :) This is the second year I’ve made this and I always make enough to give away to friends and family. It’s always a hit when I use it for entertaining. Thank you! Wonderful, Cori, thanks so much! Hi Maria, that’s purely personal preference but I’d recommend trying it with one 8-ounce package of cream cheese and give it a taste to determine if you want to add more cream cheese. Alternatively, you can serve it by spreading a bit of cream cheese on a cracker and then placing a small dollop of the relish on top. That also makes for a pretty presentation. I have reduced this sauce down to one fourth. 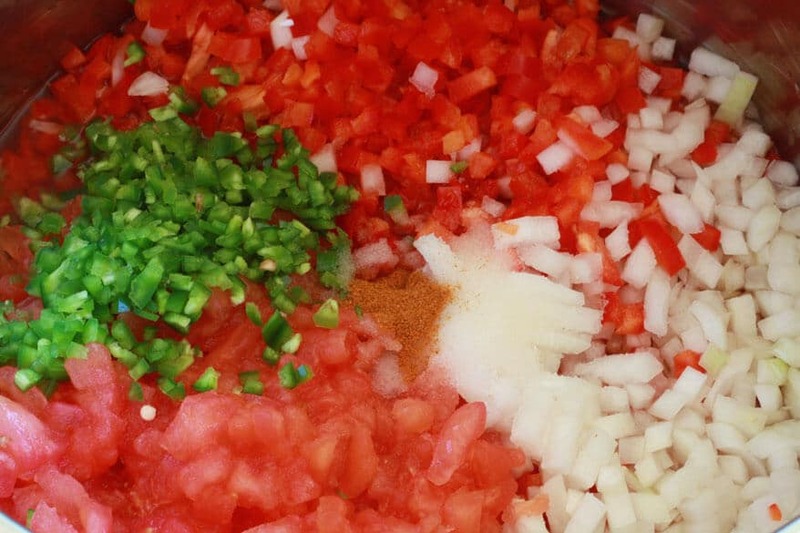 I use one can of diced tomatoes, I thicken the relish with cornstarch, I do not add the cay pepper. I split the relish when it is done and add a scorpion sauce to half. This way I have a sweet and a hot relish. This freezes well. This is my 2nd season making this relish – last time with fresh tomatoes and this time with canned. I could not tell any difference in taste whatsoever so due to the amount of labor saved I will use canned, well drained tomatoes from now on. I will splurge for organic next time for this once a season event. I did use 5 good sized jalapenos as 2 aren’t quite spicy enough for me and cut back a bit on the cayenne pepper – a shake of nutmeg and turmeric is good too. This is an excellent recipe unlike some that call for an unbelievable amount of sugar :( I always use SureJell and it works great but just realized that I used 4T for the 1/2 batch I made and should have only used 2 but it turned out to a perfect consistency so will continue to double the pectin next time. This is every bit as good and maybe even better than Harry and David which I always bought before. I won’t look for another recipe – this one is perfect! – Thanks for sharing. That sounds great, Kim, thanks so much for the feedback! Can this pectin,I assume is a dry powder,be substituted with any brand of dry pectin?? I have used the liquid pectin before and did not really like the out come.Would Sure Gel work?? Hi Rebecca, yes, you can use another pectin but the amount varies according to brand and I’ve only used Ball for this. I have made this twice now and absolutely love it! Thank you for such an amazing recipe to add to my favorites! Delish! I’m so happy to hear that, Kelly, thank you! Thank you so much for developing this recipe. I received the H&D relish in a gift basket, and since I wasn’t familiar with it, it sat for quite a while. I opened it in a moment of desperation for guests, and I polished it off after they left. Two comments to add for others who try this dish. One, I used canned tomatoes, which I drained well, but I also chopped them because they seemed like bigger pieces then I wanted in the final product. Secondly, I purchased sweet peppers from Costco in the big six pack. They are red, yellow, and orange, so no green. Since these are a bit sweeter than green peppers, I cut the sugar down by a quarter cup. (By the way, the drained tomato juice made a fabulous scratch Bloody Mary while I waited for the cook time.). Unfortunately I forgot about the thickness test, and I really needed to add more pectin to firm it up before canning. It’s still delicious, and the little 4 ounce quilted jelly jars will make perfect holiday gifts for friends and family. I’ll have a better idea of what it should look like next time, and sure to check the thickness on the next batch. As I think about it, that second bloody Mary may have contributed to missing the step… Thanks again for developing this fantastic recipe. LOL! :) That’s wonderful, Rob! I’m so glad you enjoyed it and really appreciate the feedback, thank you! Perfect holiday gifts indeed, your family and friends will be thrilled. Thanks again! If I try this recipe and plan to freeze it, would I just thicken with cornstarch instead of pectin?